Our specialized Upper Extremity Athlete Fellowship allows you to hone in on the performance characteristics of baseball, softball and other throwing athletes as well as learn how to treat the typical injuries these athletes get. The partnership we have with the Cleveland Indians and their AAA affiliate team, the Columbus Clippers, provides fellows with a rare academic experience. From working at pro spring training camp to serving the Clippers throughout their season, our fellows are there every step of the way — and guided by experienced faculty and staff. The fellowship is accredited through the American Board of Physical Therapy and Fellowship Education that supports our strong curriculum. In addition to your clinical practice and event coverage, you will attend conferences, learn through Journal Club, study advanced topics and attend grand rounds. The 12-month Upper Extremity Fellowship begins every September. Fellows are full-time employees of The Ohio State University Medical Center and work in collaboration with Ohio State Sports Medicine, the Cleveland Indians and their Triple A affiliate, the Columbus Clippers. The fellowship includes clinical care at Ohio State Sports Medicine and mentoring Sports PT residents at Ohio State. The program provides fellows the opportunity to work with the Indians’ professional baseball organization throughout an entire season with the Clippers. The Upper Extremity Athlete Fellow will practice at Ohio State's Jameson Crane Sports Medicine Institute and at the athletic training room for the Cleveland Indians’ Triple-A affiliate, the Columbus Clippers. Fellows within this program will provide rehabilitation and on-the-field management with board-certified mentors and athletic trainers. Teaching opportunities exist within Ohio State’s Division of Physical Therapy and in collaboration with orthopedic surgeons specializing in shoulder and elbow injuries. 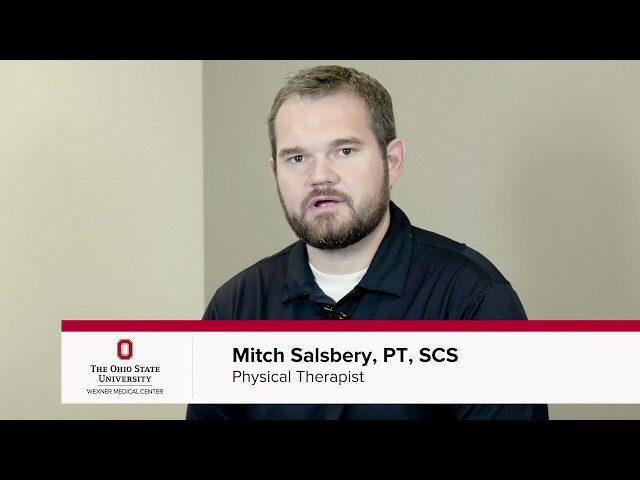 Mitch Salsbery, a physical therapist at Ohio State Sports Medicine, explains the Upper Extremity Athlete Fellowship, what makes it unique and how it benefits athletes and the Columbus community.